My normal method of writing blogs is to pick one subject and write a few paragraphs about it. However, nothing major has happened over the last week so no single topic could be extended to a full entry. Instead, here’s a round-up of what’s been occurring. At the end of last month, I spoke about the open-mike night I run for writers and that we’d found a new venue. I’m pleased to report we had a marvellous time, with a record 17 people reading stories and poetry, and many more eager ears in the audience. It would be great to see this sustained over the coming months. Last week, I mentioned I was redrafting a one-woman play I originally wrote for my Masters dissertation. Since then, I’ve boosted the word count to 11,000 and it now lasts for an hour, even delivered at a reasonably fast pace. This means it can be stripped back if necessary. In the same entry, I mentioned I was redrafting a short story. I haven’t had a chance to send this away yet, but I will soon. I have an annual target to submit 53 pieces to publishers – an average of one a week, plus one for good measure – and I’m nowhere near on par. 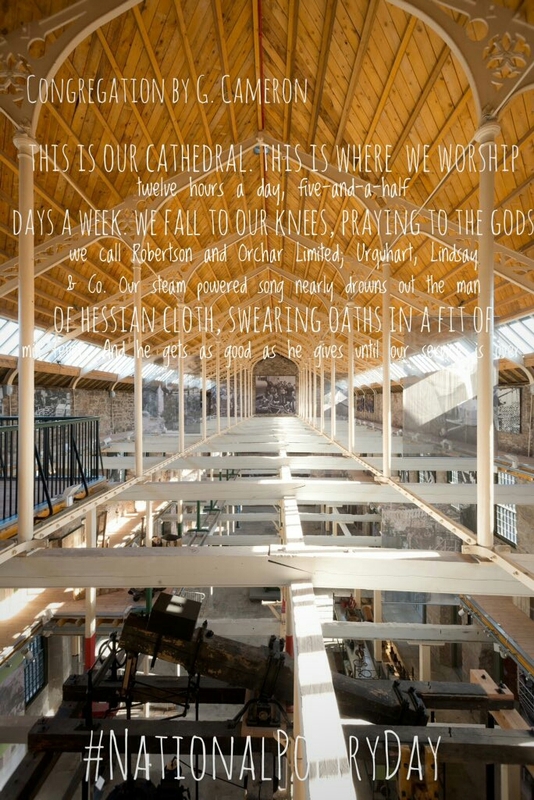 A couple of years ago, I was invited to pen a poem inspired by the former jute mill Verdant Works. I wrote the piece in situ. I later edited it, gave it the title Congregation, and sent it to the mill’s current owners to use as they wished. Many months afterwards, the poem was published online for National Poetry Day. My original line breaks had been removed, however, so the piece was laid out more like prose. The image is below; the partially obscured words in the bottom line are mill fever and service is over. I decided I liked this format better than the original. Fast forward to the present day, and the question of typographical layout has occupied me again. Generally, I steer clear of contests with an entry fee, but I make the occasional exception, this time for the NYC Midnight Short Story Competition. There are three rounds. At the starting whistle, every entrant is assigned a genre, a character, and a situation. In my case: a comedy about an art teacher and a mid-life crisis. We’re then given eight days to construct a story around these elements, and the winner progresses to the next round. I struggled to start a story with my elements as they failed to inspire me. So I began to write down some thoughts as poetry, but using paragraph breaks rather than line breaks. I’ve also limited the number of rhymes that appear. The final piece treads a line between prose and poetry that I would like the judges to pick up on. The other notable feature is that it runs to only 131 words, although there’s no minimum specified in the rules, only the maximum of 2,500. Moreover, I’m happy with the result, especially since I now have something out of virtually nothing. If it’s enough to make it into the second round, all the better. As I’ve no urgent writing projects on the go right now, I’ve turned my attention back to submitting work to publishers. There are never any guarantees in publishing, but I have a few tips to help ensure the process is as painless as possible. I maintain a spreadsheet with the following columns: Publisher, Submission guidelines, Closes, Date entered, Decision notified, Title(s) entered, Entry method, Overall submission count (target 52 per year). Most short story and poetry publishers insist that you don’t submit a given piece to any other place until they’ve accepted or rejected it. If a piece is rejected, I use the strikethrough font effect so I know it can be sent elsewhere; if accepted, it’s noted on a separate spreadsheet. Note that agents looking for novelists usually don’t mind if you send to several places at once. Right now, we’re heading into the Christmas and New Year period. Publishing lead times can be so lengthy that it’s far too late to submit festive pieces, as editors will now be planning for Easter or even summer. Yet there’s also an opportunity here: if you’re inspired to write a piece this December, there’s plenty of time to refine it and submit it in summer next year for next December. On his website, writer William Shunn offers a range of templates that contain all the information publisher needs, such as your contact details and pen name. Occasionally, you might be asked to use a certain font or a different layout. In those instances, always read the instructions carefully and follow them precisely. This is perhaps a contentious point, but it’s a purely personal point of view. When you send work to a publisher, there is almost never a charge. For a competition, there’s almost always a fee, and it can be up to £5 or sometimes more. Assuming an average fee of £3, entering even one competition a week can cost more than £150 per year. Aside from the financial aspect, I’ve had experiences where competition rules have been badly phrased or even self-contradictory, leaving me unsure how to enter. That said, there are a few competitions I make a point of entering because they’re so prestigious or because the potential payoff would be worth it, which brings me to my final point. It’s a fact of a writer’s life that some publishers want your work without payment or other reward, usually with the well-worn line that they can offer exposure. If you do simply wish to make your name known, then by all means enter your work, but be clear about this from the beginning. I generally take no payment only when it’s for someone I know personally, or if it’s for charity. Otherwise, the least I’d expect is a contributor’s copy of the finished book and/or a cash fee, however nominal. It takes a lot of effort and a lot of time to create a publishable piece, so never be afraid to charge for your work. Last week, a friend was complaining about a major writing competition that still only allows postal entries. I’d also submitted work because it’s a prestigious publication, but I agree with her point of view. Considering the hundreds of manuscripts that must be received – versus the tiny portion that makes the final cut – this seems a colossal waste of paper, not to mention the needless postage time and cost. Many competitions offer the postal route as an alternative to an online submission, and there’s nothing wrong with that. Nor is there any issue with posting work that must be physically held to be appreciated. But there are still a bunch who want normal prose and poetry to be sent on paper. Until the 1990s, this was how submissions were made. Internet access and e-mail accounts were generally the domain of academics and computer enthusiasts. Come the next decade, however, and newer technology began to creep into people’s homes. Nearly 17 years after the millennium, online access is nearly universal in the Western world, and postal submissions now look incredibly outdated. That’s not to say I don’t like a paper book. In fact, some recent research has concluded that sales of e-books are falling. But a book is the final product; the process of gaining the interest of an editor or a competition judge ought to be as quick and cheap as possible. Yet I would like to understand the other side of the argument. Do you run a publication that only wants submissions on paper? How does it benefit you? What would make you consider accepting online entries? It’s great having a polished story or poem ready to be sent to a publisher or entered into a competition, but then comes the difficult part: waiting for a response. Often it takes months, sometimes it takes weeks, and a select bunch answer in a few days. This is unavoidable. But here’s what separates a beginner from a seasoned pro: the former often sits and waits for a response, while the latter almost always uses the time to work on another piece. It’s desirable to build up a portfolio because many publishers, and almost all competitions, say you can’t send the same piece to two or more different places simultaneously. Novel submissions are different in this respect. Most agents recognise that a book is an all-consuming work, and that it could be sent to a number of other places. It’s good practice to inform the other agents if one takes it on. I’ve edited out the names of the publishers and the links to their submission guidelines as I might want to resubmit in the future. The last column keeps track of how many pieces I’ve sent out during the year. My target is at least one piece per week on average; I have a poet friend whose target is an average of at least one piece per day. Otherwise, the tracker is self-explanatory. It’s also important to keep track of what you’ve had published. These appear on another spreadsheet, and I keep the manuscripts in their own directory. In many cases, the rights revert back to the author after a period of around six months to a year, so the same piece could potentially be sent to another publisher further down the line. If you’re unsure, ask the editor. The milestones of a masterpiece. When you’re in the middle of writing a novel or compiling a poetry collection or some other big project, it can be easy to forget the end goal. One way to maintain your momentum is to remind yourself what will or might happen when it’s completed. Try creating something that represents your aim, like a mock cover for the finished volume. Or find a trophy, even if it’s made of cheap plastic, and label it something like [Your name] – Forward Prize – 2017. Or even write the speech you plan to give at your first launch. Now leave the artefact in a place you’ll see it every day, and that’ll remind you what you’re working toward. It’s not simply words on a page, but something people will buy and possibly admire. Think how you’ll feel when it really does happen.